A charism defines the particular essence of an individual or religious community. 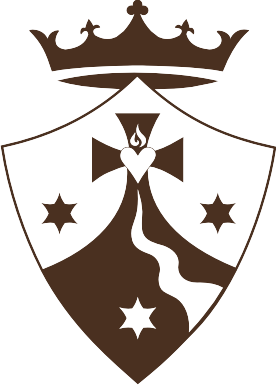 The Shield of the Carmelite Sisters of the Most Sacred Heart of Los Angeles is a symbolic expression of the Teresian Carmelite charism given to us through Mother Luisita, our Foundress. 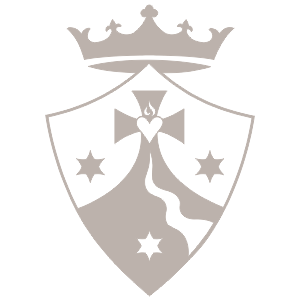 The center of the shield depicts a mountain symbolizing Mt. Carmel in Israel where the Order was born. It also symbolizes the soul’s union with God through prayer and contemplation. The lifelong deepening and intensifying of this union with God is signified by the soul’s ascent up the mountain of the Lord. On the top of the mountain is the Cross representing the person of Jesus Christ and His redeeming death. The Sacred Heart of Jesus at the center of the cross is in honor of our community’s name. In the Eucharistic love of the Sacred Heart we discover the privileged place of encounter between the human and the divine. Christ reveals His hidden presence in the ordinary events of daily life. In our call to be contemplatives in action, we seek to encounter Him in every present moment. The spring of water flowing from the Heart of Christ in the Eucharist signifies our union with God in prayer overflowing into active works. As mentioned in our Constitutions, “Whatever work is entrusted to us flows from and is a part of our union with God.” (Ch. 8) Our apostolates of education, healthcare and retreat work all form part of that stream as we promote a deeper spiritual life among God’s people. The Prophetic tradition represented in the star on the left signifies John the Baptist who prepared the way for us to enter into the new covenant. By our charism, we live out this prophetic call by disposing ourselves to receive the fullness of God’s grace in an ever deeper union with Him through prayer and facilitating this encounter with the Living God among His people. The Marian tradition symbolized by the star in the center represents Mary, Star of the Sea. She is our guiding light who abides with us as we seek to live in familiarity with God and to respond as she did in complete allegiance to Jesus Christ. The crown represents Mary as Queen and Beauty of Carmel, our model of living a hidden union with Christ in loving contemplation and fruitful service. We strive to live in docile obedience to the action of the Holy Spirit in our daily lives under her Queenship.